Here is a bookmark I cross-stitched today. Ashley has tagged us for the "eight things about me" meme. Thank you, Ashley. Here is eight things about me. 1. I got saved on September 12, 1997 when I was six years old. 3. This is my sixth year of playing the piano. 4. I'm going to be a senior this year. 5. I enjoy doing crafts. 6. I really enjoy playing the piano. 7. I like plain chocolate and chocolate with caramel. 8. My favorite soft drink is Mountain Dew. I'm tagging whoever reads this post! Two Sisters gave the Nice Matters Award and tagged us for the Middle Name meme. Here is the Middle Name Meme. Hannah will be doing hers on her blog very soon! We have been given the Nice Matters Award by Laura H.
Yesterday, our 3rd cousins, Whitney and Kaitlen had a sleep over with us. We had a lot of fun. We played games, watched a story, painted our nails, and got ready for the yard sale, we had today. We went to bed after 12:00 and us older girls got up at around 5:30 a.m. We had fun at the yardsale, Hannah and Kaitlen kept us entertained :) We had a good time. Whitney and Kaitlen left just a little while ago. 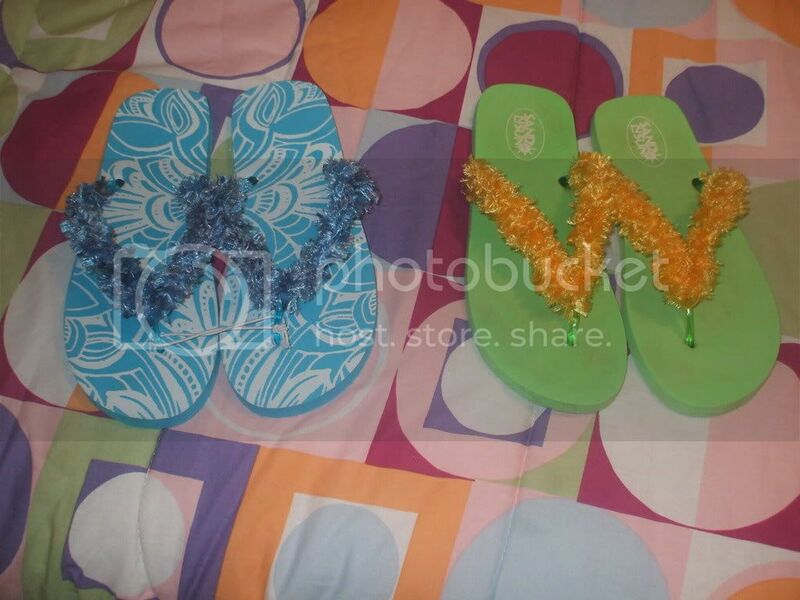 Yesterday, I crocheted the straps on some flip flops. Here is a picture. Last night, our cousin Charity had a sleepover with us. We had a lot of fun. We played games, watched videos and dvds, painted our fingernails, and other fun stuff :) Here is some pictures of our fingernails. Our Dad has put on Sermon Audio the message he preached last night. Click here to listen to it. Taylor from Taylor's Blog tagged us for the "Eight things about me." meme. Thank you for tagging us, Taylor! Grace is going to do the meme. 1. My favorite colors are lime green and baby blue. 2. I'm going into 11th grade. 3. One of my favorite groups is the Perry's. 4. I dislike mustard and mayonnaise. 6. My favorite game is Rook. 7. My favorite hobbies are Art and Calligraphy. 8. My favorite hymn is "There is a fountain.